Greenville, NC Bojangles'® Tands, INC. Store #2 - Bojangles'® / Tands, Inc.
Craving southern-style food in Greenville, NC that’s fast and affordable? It’s Bo Time! You’ll love our fast, friendly service and the delicious items on the Bojangles’® menu — Cajun fried chicken, flaky biscuits made from scratch, and popular sides like slaw and Cajun Pintos®. You’ll find convenient, tasty choices for breakfast, lunch and dinner at our Greenville location. 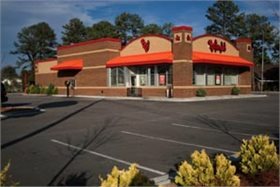 This Bojangles’® location has been a popular quick-service restaurant choice of Greenville, NC locals for years. Situated on Farmville Blvd close to Vidant Medical Center, we are a favorite for the hospital’s patients, staff and their families.